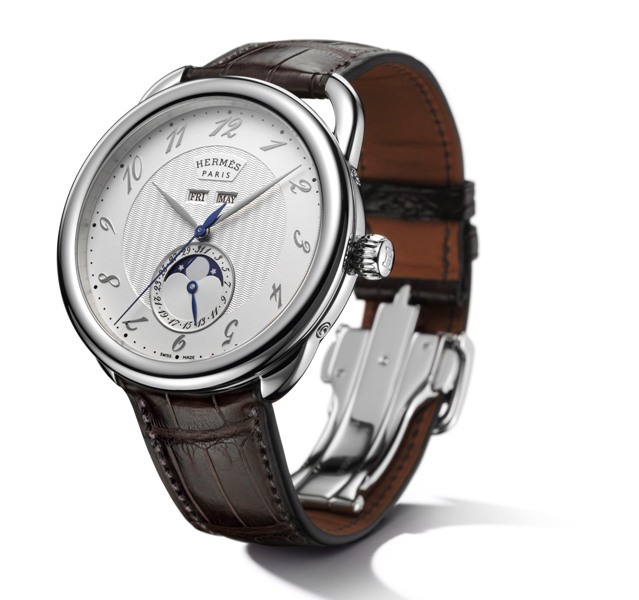 Designed in 1978 by Henri d’Origny, the Arceau watch is the one of the emblematic models in the brand’s watch collections – and one that is particularly representative of the inimitable style of Hermès, saddle-maker in Paris since 1837. This year, the brand enriches this collection with a new version. Echoing the case of the 43 mm chronograph model, the Arceau Grande Lune watch is a complete calendar watch featuring day and month apertures. Its dial is stamped with a herringbone motif identical to that found on saddle rugs. The stamped and rhodiumed numerals maintain the classic appearance of the original model, with a sloping design that follows the movement of the hands and seems to keep ahead of time. The broad opening at 6 o’clock highlights the moon disc and its rhodiumed stars specifically designed by Hermès in a deep blue shade. The calendar display indexed around the moon disc is surrounded by a rhodiumed flange, while the snailed motif radiating from the centre of the counter creates a refined sunburst effect. The moonphase module created by Dubois-Dépraz is fitted to a self-winding movement that may be admired through the transparent case-back revealing its circular-grained and snailed finishing adorned with Côtes de Genève.